how to display its information, both in CLI and webinfo mode. 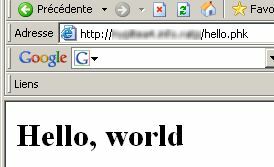 We'll follow the tradition : the package we are building here is a typical 'hello, world' example. When run, it just displays a welcome message. In order to illustrate the autoload system, we'll display the message through an autoloaded class.. This tutorial can be run on any operating system. For this basic example, everything is created and run in a single directory. Before you start, please ensure that your PHP version is 5.3.0 or newer. First, if not already done, download the latest distribution from Github. The software comes in the form of a tar/gz file. Uncompress/untar it, you will find a file named phkmgr. This is the PHK building/management tool. The rest of the distribution is made of docs, tests, and examples. Now, create an empty directory, anywhere on the system, cd there, and copy the phkmgr file into this directory (use a 'ls -l' to check that the copy is executable). This will be our base directory. For the sake of simplicity, we put the phkmgr file in our base directory. In a real build environement, it would probably be located elsewhere on the system, to be shared by every project. This file is needed to create PHK packages only. It must not be distributed along with the resulting packages, which are self-sufficient. That's all for the PHP code. Now we will focus on the package's parameters. In the PHK documentation, PSF stands for Package Specification File. As its name implies, this file contains every information needed to build the package. Here, we create a very basic, almost minimal, PSF. What do we have to specify ? The entry points. PHK supports multiple entry points, which means, for instance, that different scripts can be executed when the package is executed in CLI mode or accessed though the web. Here we will execute the same script for CLI and web access (exercise: once you finish this tutorial, use a different script for CLI and web access). The default syntax for PSF meta-information is Yaml. It is also possible to use JSON or a PHP script returning an array. The complete list of supported options is in the PHK builder's guide. Now, we have everything we need to build the package. We will assume that the 'php' command (or the 'php.exe' file on Windows) is in your path. If it is not the case, prefix the command below with the complete path to your PHP executable. This command will build a 'hello.phk' package file in the current directory. If everything goes well, it shouldn't display anything. You may note that we didn't specify anything to have the class names recorded in the autoload map, as it is the default behavior. Now, we run our new PHK package. Note that the 'Message' and 'EnvInfo' classes were automagically loaded, as they are not explicitely included. Copy your 'hello.phk' file to a directory you can access through a web server and rename it to hello.php (so that the web server recognizes it as a PHP script). Later, you will configure your web server to associate the '.phk' suffix with PHP but, for this tutorial, it is easier to rename the file with a known file suffix. You will note that it is now displayed in HTML, showing that everything was autoloaded correctly. Now, it's time to display these information in a browser. 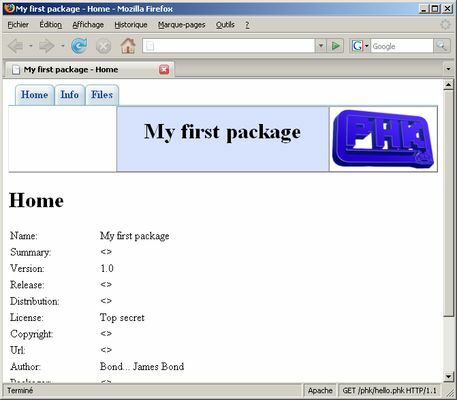 Your package now runs in webinfo mode and it behaves as a small website showing information about the package. Navigate through the different pages by using the tabs at the top of the screen. Note that there is no 'License' or 'Help' tab, as we didn't define the corresponding options. Now, you know how to build a simple PHK package. But PHK still provides a lot of features you will discover in the PHK builder's guide.